The 2013 ACMHN Consultation Liaison / Perinatal & Infant Mental Health Nurses Annual Conference was held on June 6th and 7th, in Noosa – on Queensland’s Sunshine Coast. It is a boutique conference: these two subspecialties account for a tiny fraction of the total mental health nursing workforce. Given the size of these subspecialties, the conference organisers were pleased with the attendance of about 70 nurses, who gathered together from New Zealand and most states/territories in Australia. 70 is probably about par for the course. The theme of the conference was “Present and Available” – an exploration of the process of presence, being with and affecting change in the variety of settings that we work. This post explores whether social media can also help mental health nurses and their conference content be present and available to others via social media, specifically: via twitter. It’s surprising and enthusing (to me, anyway), that a boutique conference being held in a small regional Australian city attracted such an eclectic, geographically widespread group of social media participants. 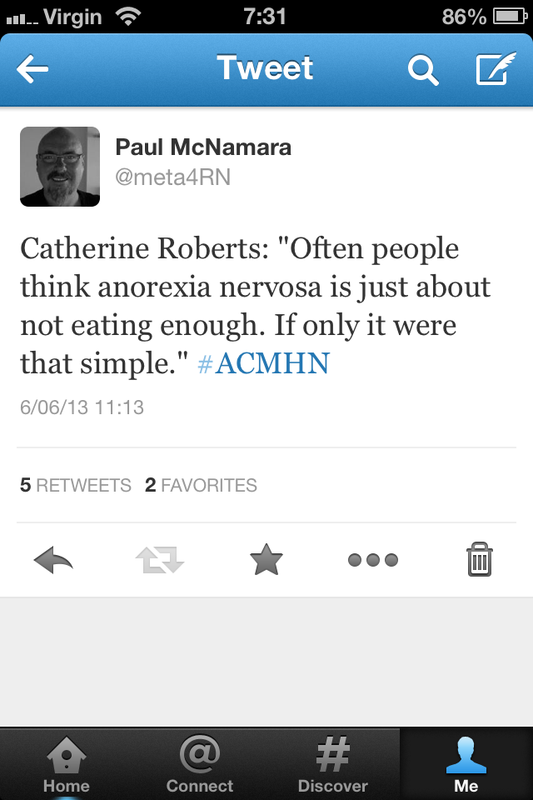 The 26 #ACMHN hashtag participants sent 141 Tweets in the timeframe being examined. The three delegates generated 90 #ACMHN tweets, being 64% of the total during the examined period. Use of the #ACMHN by those away from the conference was almost entirely in the form of retweets – a simple process where one twitter user shares the content of another twitter user, thereby spreading information quickly and widely. Through this compounding, amplifying effect that social media activity has, during the 96 hours being examined the #ACMHN hashtag had a potential reach of over 94,000 (source). Two specific examples of this will be examined below under Twitter is an Amplifier. The qualitative data is the content of the tweets. Assuming that a key purpose of a health care conference is to share information, it would be foolish to overlook the amplifying effect of social media. This first example of a simple statement in a presentation on anorexia nervosa, shows how a message reached beyond the 70 people at the conference to a potential audience of over 20,000. So, the potential (not actual) audience for that one message delivered to 70 conference delegates suddenly becomes a message that would have been seen by thousands of people. How many exactly? No idea. As long as you pick a number less than 22,274 your guess will be as good as mine. Another example of Twitter being used as an amplifier is with this Tweet regarding the publications of one of the conference presenters. The bit at the end that reads “Ping #nswiopCS13” can be interpreted as “You people following the Advances in Clinical Supervision conference may also be interested in this”. One of those in attendance at the Clinical Supervision conference retweeted, as did two Professors of Nursing: one with James Cook University in Cairns, the other with City University in London. So, while the numbers of people exposed to the presenter’s publications via a tweeted internet link is more limited than the previous example, they were also more targeted… nobody values peer-reviewed journal publications more than an academic. It’s good for Chris Dawber’s professional profile to have nursing academics on either side of the world to be aware of his papers and sharing them with their Twitter followers. It is also useful that Chris had his papers bought to the attention of those at/following a Clinical Supervision conference that was being held in Sydney at the same time as our conference. The link to Chris’s papers is here. This amplifying effect of Twitter comes with a cautionary note… what if I misquoted or inadvertently misrepresented what Catherine Roberts said? I don’t doubt that I’ve captured the essence of what Catherine said as I heard/understood it. However, by using quotation marks I have attributed it as a direct quote from Catherine. Now, a few days after the conference, I’m not 100% confident that I have used Catherine’s exact words. Naturally, I’ll pass-on a genuine and contrite apology to Catherine if I have got it wrong and caused any offence or embarrassment. However, in practical terms, it’s too late – the horse has bolted. For better or worse, there are probably thousands of people who now think that’s what Catherine said. Another point of risk: all the way through the conference I tweeted out the take-home message from sessions as I understood it (as seen by scrolling through here). What if I’ve missed the point that speaker wanted emphasised? What if I got it wrong? Does that make social media too scary and dangerous to use professionally? Of course not. Be careful with what you Tweet if you’re attributing it to others. For example, only use quotation marks when you’re sure you have the presenter’s exact phrasing correct. Also, try to make it clear whether the take home message is the presenter’s words, or your own understanding/interpretation. Encourage more social media conference participation. As with this example from a keynote presentation at the International Council of Nurses 25th Quadrennial Congress, it’s more interesting to have multiple people using social media rather than just one. Multiple participants also makes it less likely that a single participant’s misunderstanding will be read in isolation… a safety in numbers thing. 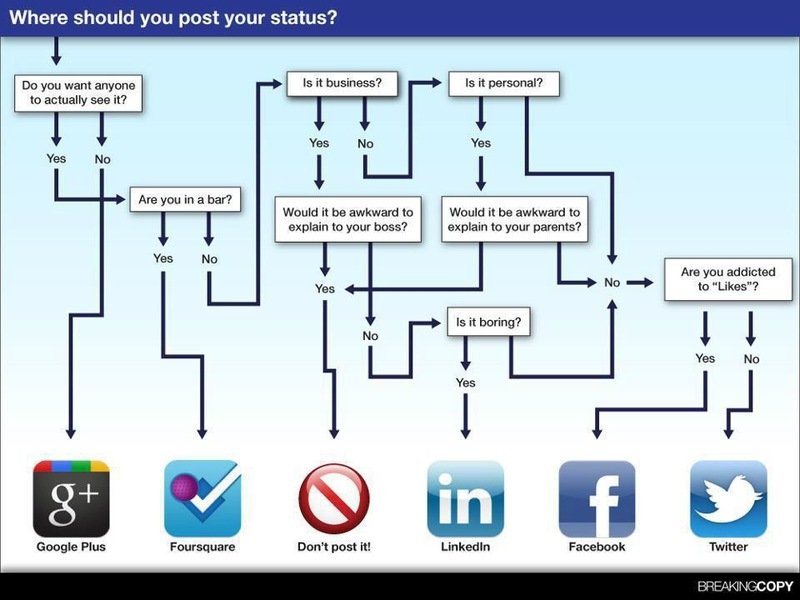 For presenters: take control of your social media presence – don’t leave it to chance. That’s what I did with my presentation at the conference (see example below). For presenters, the alternative way to take control of your social media impact from a conference is to announce, “No Live Tweeting Please”. That’s fine – it should be the presenter’s prerogative. However, what you’re actually saying is either, “What I Have To Say Is Too Precious For People Like You To Share” (in which case, should you be talking about it at a conference? ), or “I Do Not Understand or Trust Social Media” (which sounds a bit like, “I do not understand or trust traffic lights” – charmingly quaint, but oddly old-fashioned). Through examining and reflecting on this collection of data, I am gathering confidence and understanding of professional use of social media. By sharing it online, hopefully other health professionals will do likewise: more the merrier. That’s it. As always, your comments/feedback are welcome. 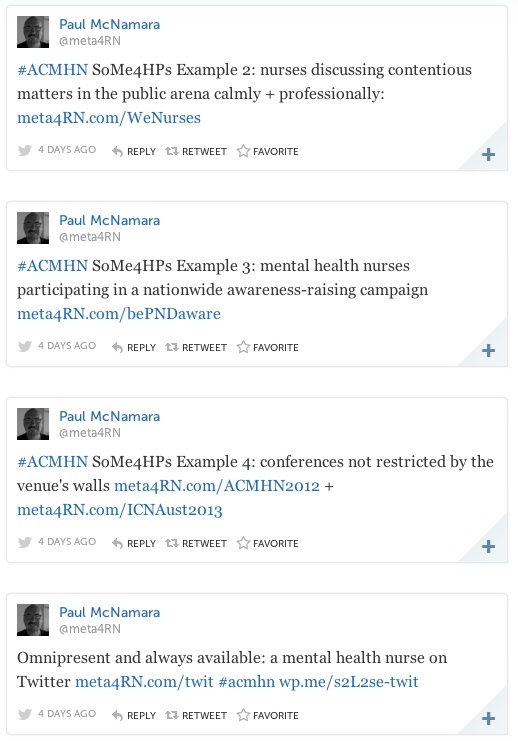 This entry was posted in Blog and tagged #SoMe (Social Media), ACMHN, consultation liaison, nursing, Perinatal Mental Health, Storify on 12 June 2013 by Paul McNamara. The perinatal mental health workshop goes for 4 hours, with three scheduled 5-10 minute breaks. It has been repeated and refined dozens of times over the last 12 years (pretty sure I did the first one in 2001). I haven’t kept count of how many people have done it – it would be a number somewhere either side of 300, I guess. The workshop is based on adult learning principles and is divided into two parts: knowing (empirical learnings) and doing (experiential learning). An example of the flyer/agenda for the workshop is here (PDF). The primary message I want (hope) participants to take home is that by being authentic, emotionally intelligent professionals we can make our screening more sensitive and our responses more therapeutic. In the perinatal mental health workshop we talk together. There is nearly always more than 100 years of clinical experience in the room, sometimes there is over 200 years of experience in the room. There is no powerpoint presentation. There are nurses, midwives, indigenous health workers and allied health staff. We share our knowledge, our experiences and our stories with each other as a group. There is a lot of information to get through; the workshop facilitator’s job is to keep the mutual sharing of information safe, and to give it structure, credibility and meaning. The facilitator makes sure to keep the agenda and the learning objectives on track. As is befitting of an adult education session, the workshop is a conversation. Maybe Twitter is just another conversation. A conversation not as intimate or in-depth as the one held in the workshop, but a conversation that isn’t restricted to one specific place or one specific group of people. As an experiment on 8th February 2013 I used social media (this Twitter account linked to a Facebook page) to bookmark resources for participants and share them with anyone else who is interested. Using HootSuite 19 pre-scheduled Tweets with the #bePNDaware hashtag were sent before or during the workshop. One Tweet was sent during a break in the Workshop (the one about Circle of Security – I was rushing and sent a broken link – oops), and one after the workshop had finished (the one with the photo of the whiteboard). The scheduling of tweets allowed the facilitator to be fully present during the workshop, while simultaneously making links to the resources/topics discussed in the workshop readily available to workshop participants and a broader audience. 9 other Twitter accounts retweeted 6 of the original tweets; the tweet re the Clinical Practice Guidelines was retweeted 3 times. In all, between 7:00am and 7:00pm on 08/02/13 (Cairns time) there were 30 workshop-related Tweets which, through the compounding effects of social media, yielded a theoretical/potential reach of 17,783 (source). The actual impact would have been much smaller, but is difficult to quantify (for me, anyway). 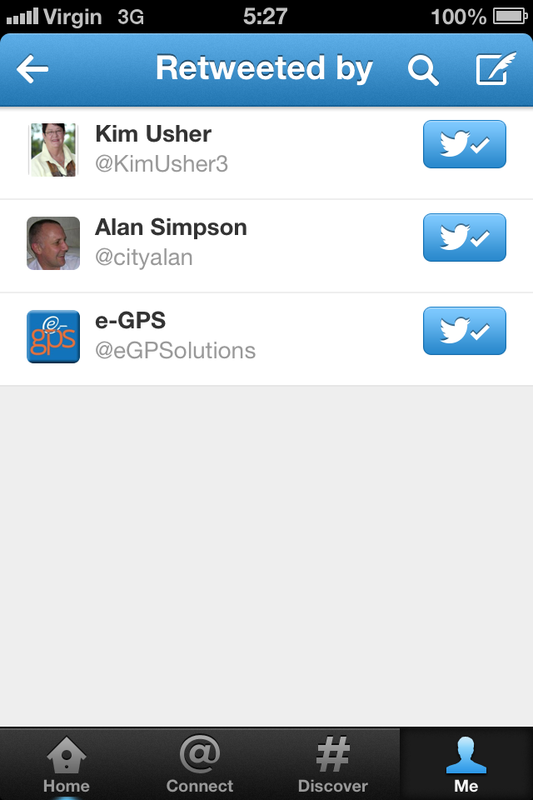 To see who joined the conversation by retweeting and other data, please visit Symplur. That’s it for this attempt to use a 4 minute video to give a glimpse of a 4 hour workshop, and to share the idea of using social media as a tool to expand the reach of an education session. This entry was posted in Blog and tagged #SoMe (Social Media), geeky stuff, Perinatal Mental Health, prezi, Storify, Twitter, workshop, YouTube on 29 May 2013 by Paul McNamara. 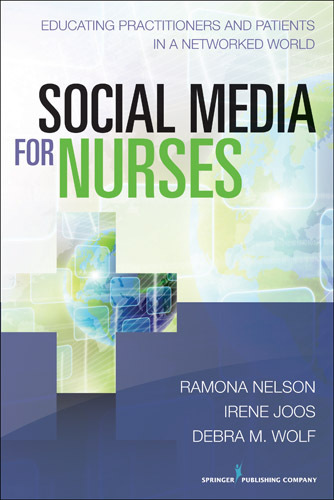 There’s been a new book released called Social Media for Nurses: Educating Practitioners and Patients in a Networked World. I have not read the book, so for all I know it’s the most enlightening piece of literature in the world, but finding-out about its existence did get me wondering – do nurses really need to read a 284 page book on using social media? Asking such a question = running the risk of seeming like some ranting, permissive, anti-academia, anti-intellectual hack. I am permissive, and can be a bit ranty and hack-like at times, but am neither anti-academia nor anti-intellectual. I just think a book talking about social media for nurses is less valuable than nurses acquiring first-hand experience observing and using social media. Now I’ll take a big breath and argue my case. I remember as a first year student nurse giving an IM injection for the first time. Preparation included some didactic teaching about the process and physiology of asepsis, locating the appropriate injection site, and rationale for IM injections. We also had interactive tutorials about some of the do’s and don’ts of IM injections. Then we student nurses were directed to review the relevant policies and procedures in our training hospital. The final part of classroom-based teaching was when we had a chance to rehearse the physical skill/dexterity of giving an IM injection – using oranges, of all things. This is how student nurse vodka-orange parties get started. Anyway, all of that was useful background learning for the clinical environment. In most hospital wards administering medication via IM injection is an unremarkable, routine nursing task. Experienced nurses are usually very adept at the skills involved in IM injection preparation, administration and documentation. Generally speaking, it is only the novices (ie: patients unfamiliar with being unwell and new student nurses) who find IM injections intimidating. Student nurses move from novice to beginning practitioner in nursing skills through experiential education, which is often referred to as “See One, Do One, Teach One”. The final part of embedding the skill of giving IM injections is when I went from being the mentored to the mentor. If you ever want to learn something really well, you could do worse than aim to teach it really well. If there is a 284 page book on giving IM injections I have not read it. If I did read it, it still would not have overcome the very necessary part of experiential learning – the “See One, Do One, Teach One.” part. And so it is with social media. Look, I’m not an expert in anything much, least of all social media. Even Mark Zuckerberg would need to be a bit cautious about calling himself a social media expert – Facebook did not exist before February 2004. Twitter didn’t exist before March 2006. We are all relatively new to social media, so only the brave amongst us claim the title “social media expert”. “Expert” usually implies both depth of knowledge and length of expertise; given the relative recency of social media, the former is in short supply, and the latter is all-but unavailable. Additional Info. 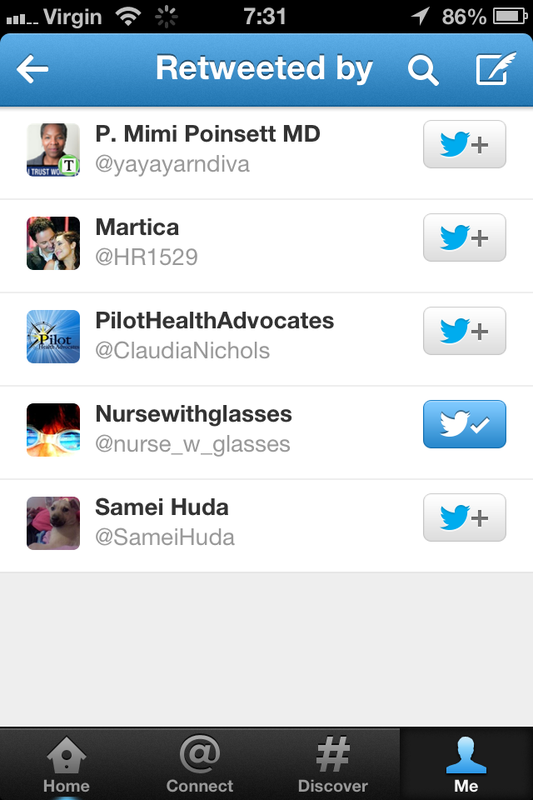 Learn by watching other nurses using social media in a professional capacity. Not sure where to get started? You could do much worse than following nominees for 2012 Social Media Nurse of the Year, they each have their Twitter handles listed here. The nurse who created Social Media Nurse of the Year disqualified himself from being nominated. Be sure to follow Ian Miller via his impactednurse social media portfolio: Twitter, Facebook or Blog. Additional Info. This includes all the usual stuff about patient confidentiality too. Additional Info. Learning by mistakes will be part of learning social media. I’ll probably fall for taking troll-bait again when discussing something I feel strongly about, but my troll-radar is more refined than it used to be. Additional Info. Those that do name their employer often add the disclaimer “views my own”. I am not sure why this is so. It is usually assumed that people are representing their own views, not their employer’s, when chatting via phone or email, so I’m not really sure why it would be considered different on Twitter/social media. Anyway, just to clarify: although I was once an altar boy in a Catholic church, the views I express on social media do not represent the views of God, Jesus, The Pope, or other members of the Catholic clergy or congregation. Same goes for previous, current and future employers. Additional Info. There might be exceptions to this rule if there is something positive, fun and noteworthy to Tweet about, eg: “Here is a photo of the prize-winning Christmas decorations on the Paeds ward” (no patients in photo). Additional Info. This is probably the best single bit of advice I can give. The risks of social media are commonly overstated by those who are not using it, feel threatened by it, or are trying to make a living out of it. For the rest of us, nurses or not, it’s a fun way to find and share information and interact with interesting people from all over the world. What have I missed? What advice would you give to a SoMe newbie? Please feel free to add your suggestions in the comments section below. * The lady who I administered my first IM injection to really was Portuguese, and she did say something in Portuguese after I gave the injection. However, judging from her grimace, I doubt very much that she said anything like the completely fabricated sentence in quotation marks above. This entry was posted in Blog and tagged #SoMe (Social Media), Facebook, Google+, nursing, Storify, Twitter on 20 January 2013 by Paul McNamara. Earlier today (Cairns time) Nurses from the United Kingdom and Australia came together on Twitter to discuss issues raised by the death of a colleague. This matter has received a lot of media and social media publicity over the last two weeks. The Twitter chat was hosted by UK social media portal www.wenurses.co.uk – thanks must go to Teresa Chinn for her time and enthusiasm in bringing this chat together. During the chat thirty-three (33) participants used the #wenurses Twitter hashtag, there were 360 Tweets, and the potential “TweetReach”/impression of the chat was well in excess of one million views (data courtesy of www.symplur.com). The content of the Twitter chat has been curated and organised as below. This is my subjective arrangement (that is: subject to disagreement – another curator may have made different decisions about what to include/exclude). The intent of curating the content is to clearly identify the themes that emerged during the discussion, and to assist understanding by arranging the themes under subject headings. Twitter is a vibrant, immediate tool, but conversations do overlap in an asynchronous manner; consequently, comments appear to be jumbled/out-of-context if the transcript is read strictly in chronological order. Sub-Issue: Patients and Mobile Phones. The curated version of the discussion is presented using Storify – I urge you to browse through the posts by clicking here. Jacintha Saldanha, a Nurse living and working in Britain, died a fortnight ago – just a few days after been inadvertently involved in an Australian radio station prank. Earlier this week her funeral was held in her home town in India. 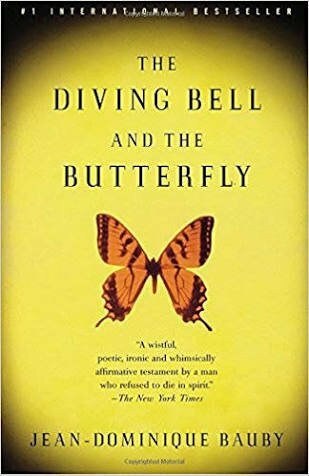 Jacintha’s death made news headlines in the United Kingdom, India, Australia and elsewhere day after day after day; all manner of media commentators and armchair critics were asked to trot-out their opinions on the matter. As far as I saw, not many media outlets ever got around to speaking to nurses/nursing organisations about the nursing perspective. At the same time mainstream media was giving the subject saturation coverage, social media erupted with reactions. Sometimes – far too often – responses and opinions were unhelpful and misinformed. 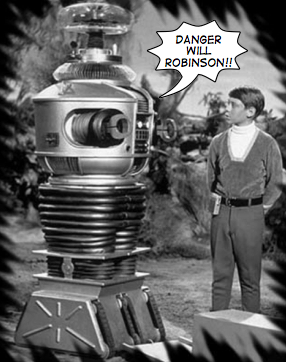 Some very nasty and stupid stuff has been Blogged, Tweeted and Facebooked. As mentioned in an earlier post, despite the inclination of many to point fingers, the truth is that suicide is a complex matter that should not be blamed on a single event or single interaction. Thoughts of self harm are most likely to occur when significant, long-term stress, depression, anxiety or other mental health problems are present. Out of respect to Jacintha’s family, friends, workmates and the Coroner’s Court, we did not speculate about her life and death on today’s Twitter chat. It is note-worthy that the prank phone call received barely more than a mention in today’s Twitter chat. Today’s Twitter chat was not about Jacintha, it was not about radio DJs, it was not about the media, it was not about the lack of understanding of suicide, and it was not about social media being used as vehicle for ignorance. Today’s Twitter chat was about Nurses using social media in a constructive manner, and responding to the highly publicised death of one of our colleagues with thoughtfulness and grace. Does this hour-long chat between nurses via Twitter contain more calm, practical wisdom than nearly everything else written about this sad event to date? If the answer is to question 1 is “Yes”, why didn’t the media ask nurses for an opinion on what the salient issues were? 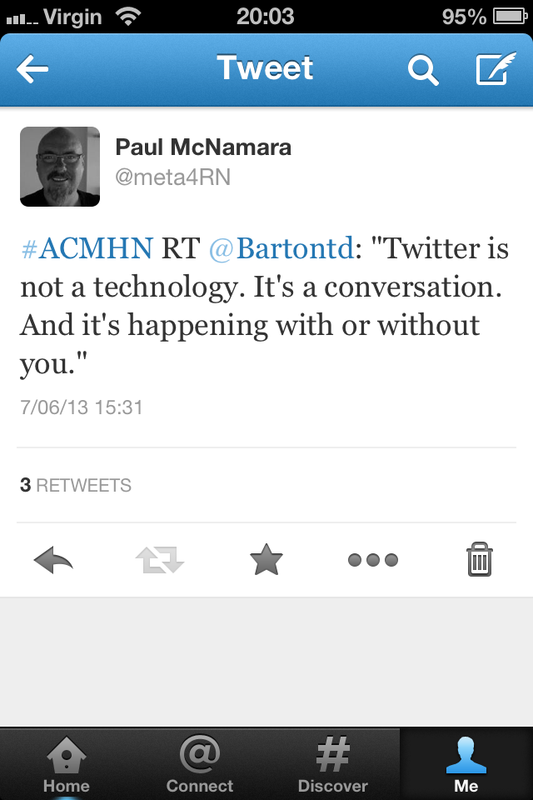 Today on Twitter #WeNurses identified and discussed the salient nursing issues: communication and compassion. The world’s most popular search engine (Google) displays a picture of a red telephone and the helpline phone number if searching for a suicide-related topic. 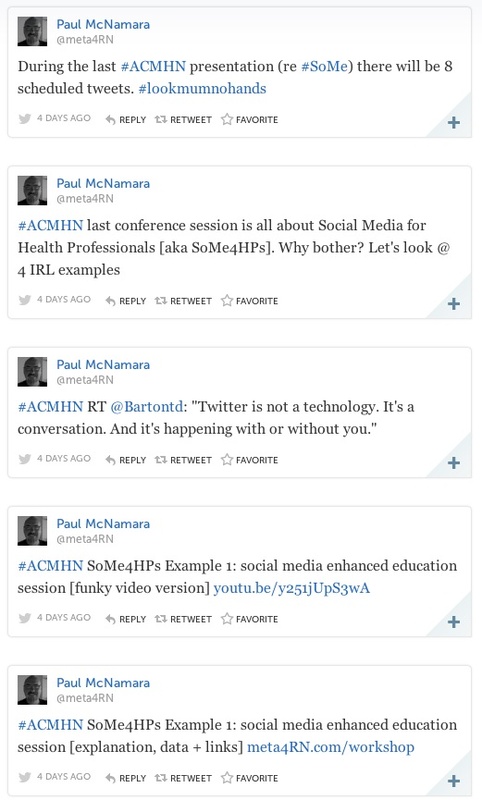 This entry was posted in Blog and tagged #SoMe (Social Media), emotional intelligence, nursing, Storify, Twitter on 21 December 2012 by Paul McNamara.